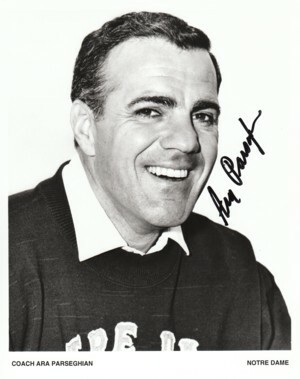 Ara Parseghian served as head coach for three teams, most notably the University of Notre Dame team from 1964–1974. During his 11 seasons as head coach of the Fighting Irish (known popularly as "the Era of Ara"), he compiled a 95–17–4 record, for a .836 winning percentage, making him the most successful Notre Dame coach of the modern era. Ara Parseghian has hand autographed this Notre Dame Fighting Irish 8x10 Photo. Certificate of Authenticity from Athlon Sports. Private Signing July 30th, 2005. Signature has smudge in signature and is sold as is, no returns.